Bearded capuchin monkeys deliberately place palm nuts in a stable position on a surface before trying to crack them open, revealing their capacity to use tactile information to improve tool use. The results are published February 27 in the open access journal PLOS ONE by Dorothy Fragaszy and colleagues from the University of Georgia. The researchers analyzed the monkeys' tool-use skills by videotaping adult monkeys cracking palm nuts on a surface they used frequently for the purpose. They found that monkeys positioned the nuts flat side down more frequently than expected by random chance. When placing the nuts, the monkeys knocked the nuts on the surface a few times before releasing them, after which the nuts very rarely moved. 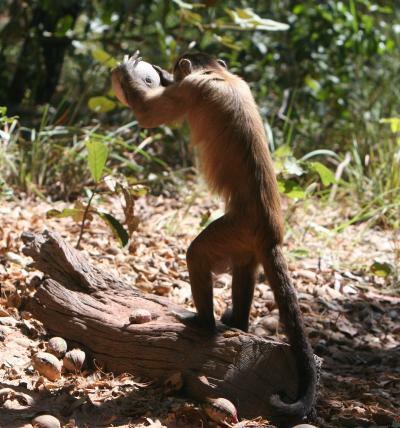 The researchers suggest that the monkeys may have learned to optimize this tool-use strategy by repeatedly knocking the nut to achieve the stable position prior to cracking it. They conclude that the monkeys' strategic placement of the nut reveals that the monkeys pay attention to the fit between the nut and the surface each time they place the nut, and adjust their actions accordingly. In a parallel experiment, the scientists asked blindfolded people to perform the same action, positioning palm nuts on an anvil as if to crack them with a stone or hammer. 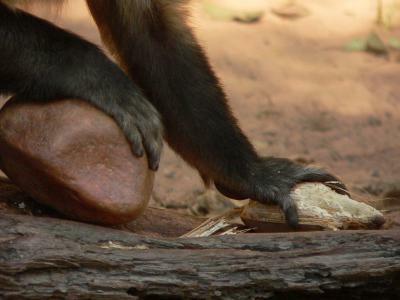 Like the monkeys, the human participants also followed tactile cues to place the nut flat-side down on the anvil.